The Hanford Site's 300 Area—being monitored by PNNL's electrical resistivity tomography (ERT) imaging software—is about a quarter-mile west of the Columbia River. At the southern tip of the sprawling Hanford Site, the soil beneath the 300 Area contains residual uranium from a handful of now-removed settling ponds and trenches that stored liquid waste from the processing of spent nuclear fuel rods. 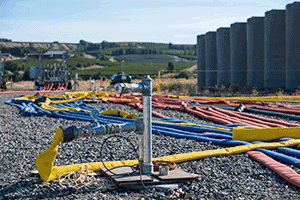 Located about a quarter-mile west of the Columbia River shoreline, underground uranium concentrations remain high after years of plutonium production. The Department of Energy Richland Operations and its site contractor CH2M HILL Plateau Remediation Company (CHPRC) recently finished injecting an approved polyphosphate solution into the ground that will bind with uranium through a process called sequestration, preventing the uranium from reaching the groundwater and Columbia River. Surrounded by storage tanks and injection hoses, PNNL's E4D subsurface imaging technology monitors the delivery of a phosphate solution for binding contaminants in the soil at the Hanford Site's 300 Area. 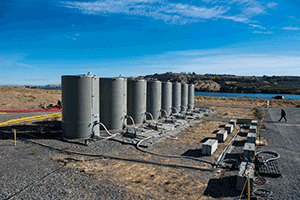 PNNL researchers worked with CHPRC to successfully implement a state-of-the-art approach for monitoring the delivery of the polyphosphate remediation action. The approach used PNNL’s Real-time Four-Dimensional Subsurface Imaging Software, or E4D, to image the vertical and lateral movement of the polyphosphate solution. E4D uses electrical resistivity tomography (ERT) measurements to reconstruct time-lapse images of the electrical conductivity of the soil. As the polyphosphate solution permeated the soil and the ground’s electrical conductivity increased, an array of ERT sensors continuously measured the change in conductivity. E4D uses the measurements to produce images of the polyphosphate remedy distribution over time. The polyphosphate remedy, delivered at two depths from a patchwork of 48 total injection wells, spread through the soil. 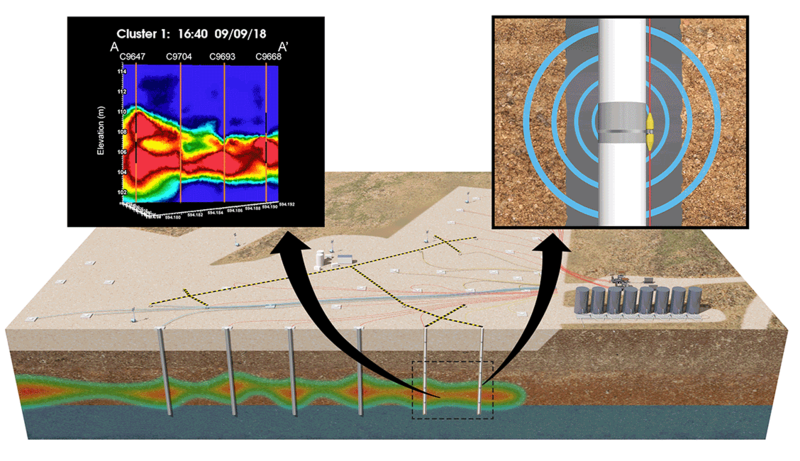 To help the site contractor “see” the spread of the phosphate solution underground, PNNL placed its ERT sensors in a unique cross-hole pattern within clusters of injection and monitoring wells. During the phosphate solution injections, the ERT system injected electrical current into the subsurface. Sensors running the length of each well measured the corresponding changes in soil voltage. Those measurements instantly traveled via wireless internet to Constance, a supercomputer at PNNL’s Institutional Computing Center. There, Constance began processing the data, combining geology, physics, mathematics and chemistry with E4D’s sophisticated modeling software to create time-lapse three-dimensional images of the solution and its location—all within minutes. As the E4D software executed its program, color-coded pools quickly began appearing on the display. Through a custom web interface, the science team, operations staff and key stakeholders at multiple locations watched the mobility of the phosphate solution in near real-time—the fourth dimension in E4D. Within minutes of data acquisition, the E4D modeling software translated that information into images for onscreen display. Over the course of three weeks, the compiled images revealed a noticeable “breathing” pattern. The colored pools appeared as the injections took place during the day shift, then tapered off overnight, then reappeared as injections started again the next day. E4D was developed with support from the U.S. Department of Energy and the U.S. Department of Defense and is freely available to anyone. In 2017, R&D Magazine named it one of the 100 most innovative scientific breakthroughs of the year.